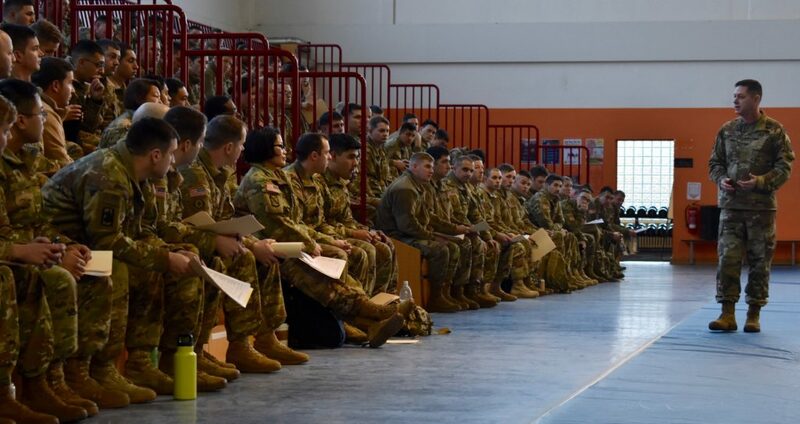 ILLESHEIM, Germany (Feb. 5, 2019) — U.S. Army Garrison Commander Col. Steven M. Pierce welcomed the initial larger contingent of 1st Combat Aviation Brigade, 1st Infantry Division Soldiers, here on a nine-month rotation from Fort Riley, Kansas. More than 320 Soldiers of the “Big Red One” had assembled at the Theater and at the Fitness Center on Storck Barracks for briefings and in-processing procedures. Pierce addressed the Soldiers at each location, pointing out that during their important mission in support of Operation Atlantic Resolve they would have great opportunities for effective training, while honing interoperability skills with other NATO partners. He also recommended to Soldiers to seize the various opportunities for travel and to build friendly relations with members of the local communities. For more photos, visit GC welcomes 1th CAB Soldiers.